FALMOUTH — In Japan, it’s well-known, they do printmaking well. A delightful show at Highfield Hall & Gardens in Falmouth demonstrates that the era of great Japanese printmaking didn’t end in the 19th century, when ukiyo-e prints were furtively traded and swapped by collectors, connoisseurs, and artists all over Europe and America. It continued well into the 20th, enjoying an explosive revival in the period after World War II. An organization that played a leading role in assuring Japanese printmaking’s postwar prominence was the College Women’s Association of Japan. The CWAJ was originally established by alumnae clubs from Mount Holyoke College and several sister schools. These clubs wanted to provide financial assistance to Japanese students wishing to study in the United States. The CWAJ launched its first exhibition of prints as a fund-raiser in 1956, seven years after its founding. It hasn’t looked back. The association, which today promotes education and cross-cultural exchange through a program of scholarships, opened its 60th anniversary print exhibition in Tokyo last year. It was attended by the empress of Japan. A 60th birthday, or “kanreki,” has special significance in Japanese culture. It marks a rebirth, sanctioning a return to the spirit of childhood. And so it is a big deal for Falmouth, the only US venue, to be hosting this prestigious show, which in previous editions has appeared in London (the British Museum), Sydney, Philadelphia, and Washington, D.C.
Highfield Hall, a historic landmark and cultural center, with stately rooms and spectacular gardens, has responded with an array of festive, Japanese-themed programming. The show itself includes work by more than 200 individual printmakers. Many are younger artists working in an experimental vein, some with great success. Giving heft to this anniversary edition are many older artists with established reputations. None is better known than Toko Shinoda. Shinoda first visited New York City in 1956. There she found herself at the center of the fledgling Abstract Expressionist movement. She became well known for bold but gorgeously nuanced works marrying the Japanese calligraphic tradition with Abstract Expressionist mark-making. Her works here combine vigorous, slanting marks with layered textural effects of great delicacy. For almost a decade after its beginning, the CWAJ print show focused exclusively on woodblock prints. These were by artists associated with the so-called “sosaku hanga” style: individually expressive prints, influenced by Western modernist movements like Cubism and Fauvism but still strongly evoking Japan. 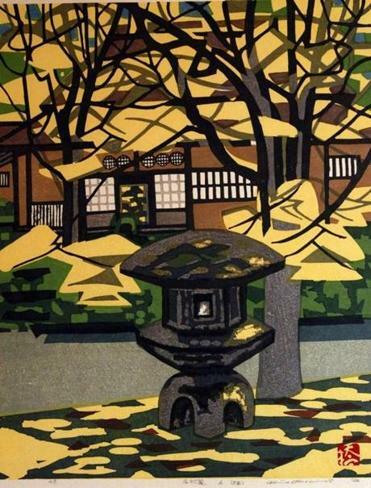 Okiie Hashimoto’s colorful 1962 woodcut, “Stone Lantern A (Katsura),” is an attractive example. Sosaku hanga prints appealed greatly to a postwar public hungry for expressions of modern Japan — and perhaps especially to the half million members of the occupying forces involved in rebuilding the country. The range of printmaking techniques taken up by Japanese artists exploded in the ‘60s and ‘70s. Today every type of print is on display, from etchings and aquatints to lithographs, screenprints, and photolithography. Every style and sensibility, too. It is fun to go from works in a recognizably modernist, abstract vein by Shinoda and the esteemed Chizuko Yoshida to playful figurative works by the likes of Valerie Syposz. Syposz’s recent lithograph “Validation of Existence” shows a scrum of human hands extended in the air holding cellphones and selfie sticks. Very droll. Many of the finest works in the show mesh staggering detail, daring compositions, and textural effects with a quality of imagination that is lively and free of cliché. Susumu Endo’s black-and-white offset lithograph “SPACE & SPACE N1401” presents two fuzzy-edged rectangles, one atop the other, like a painting by Mark Rothko. The bottom shape is uniformly dark but for a thin horizontal line crossing its center. The top rectangle presents a detailed, aerial view of a forest in winter striated by hundreds more horizontal lines. The effect is entrancing. Masuda Nao’s “How to View Continuing Nature,” meanwhile, is a large-scale etching in elongated, horizontal format. Still in her mid-20s, Masuda has an incredible feeling for the textures of nature, both near and far: bunched leaves, patterns on birch bark, distant foliage on hillsides. She compresses passages that, by their rendering, suggest both macro and micro scales into a flat, unified composition of tremendous originality. For me, the work is the highlight of the show. But don’t miss, too, a display of works by even younger artists, all of them from Fukushima, the city devastated by a nuclear accident in March 2011. CWAJ responded to the disaster with a number of programs aimed at children, one of them a printmaking course. The resulting works — including second grader Sumika Saito’s “My Treasure,” a drypoint rendering of sneakers, and second grader Hikari Fukaya’s jaunty collagraph “Marathon Race” — are wonderful. Sebastian Smee can be reached at ssmee@globe.com.